US funds terrorists to overthrow Syrian government based on "humanitarian concerns," while US President Obama to lend legitimacy to "dictator-for-life" Hun Sen of Cambodia with upcoming visit. 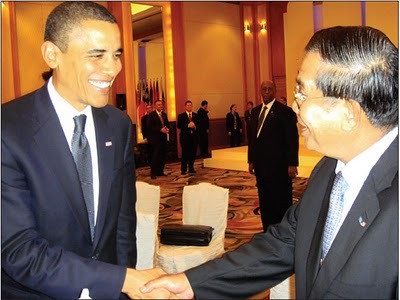 The US President shaking hands with Cambodian dictator Hun Sen in 2010. The United States and its allies have maintained that their commitment to supporting militants operating inside of Syria is based on "humanitarian concerns" and in helping "oust a dictator." The US has recently handpicked the Syrian opposition, and has pledged funds and logistical support to help arm militants who have, since 2007, been identified as sectarian extremists affiliated with Al Qaeda, not secular "pro-democracy" "freedom fighters." This was first exposed by Pulitzer Prize-winning journalist Seymour Hersh in his 2007 New Yorker report titled, "The Redirection: Is the Administration's new policy benefiting our enemies in the war on terrorism?" The US attempts to bury this reality and instead highlight its alleged humanitarian agenda with publicized donations to refugee camps created by the very violence they have created and fully plan to perpetuate. The US has just recently claimed it has pumped another 34 million USD for "humanitarian aid" according to Sky News. US Claims to Fight Dictatorship, Yet Coddles a Menagerie of Mass Murdering Despots. Yet despite this window dressing, the fact that the US is supporting sectarian terrorists is not the full extent of Western hypocrisy. It was covered recently that deposed dictator and accused mass-murderer Thaksin Shinawatra of Thailand was allowed to travel to the United States and engage in political activity. Shinawatra had overseen a "War on Drugs" that saw nearly 3,000 people extra-judicially executed over the course of 90 days, most of whom were later found to have had nothing to do with illicit drugs - Human Rights Watch (HRW) would confirm this in their 2008 report titled, "Thailand’s 'war on drugs'," a follow up to the much more extensive 2004 report, "Not Enough Graves." . Now the US prepares for yet another display of overt hypocrisy as US President Barack Obama prepares to meet with the Prime Minister of Cambodia, Hun Sen. Accused mass murderer and formerly a member of the genocidal Khmer Rouge, Hun Sen has since sat in power for well over two-decades. While running under the illusion of "people's power," he has since 2008 sold over half of his nation off to foreign investors, right out from under the Cambodian people. By March this year , virtually all Cambodia's accessible and sandy coast was in private hands, either Cambodian or foreign. Those who lived or worked there were turfed out - some jailed, others beaten, virtually all denied meaningful compensation. It was abundantly clear to observers, including the World Bank and Amnesty International, that by making these private deals, Hun Sen was denying prosperity to most of his people, causing the country's social fabric to unwind like thread from a bobbin. Today, more than 150,000 people are threatened with eviction. Forty-five per cent of the country's entire landmass has been sold off - from the land ringing Angkor Wat to the colonial buildings of Phnom Penh to the south-western islands. Professor Yash Ghai, the UN human rights emissary to Cambodia, warned, "One does not need expertise in human rights to recognise that many policies of the government have... deprived people of their economic resources and means of livelihood, and denied them their dignity." He added, "I believe that the deliberate rejection of the concept of a state governed by the rule of law has been central to the ruling party's hold on power." It would seem as if Cambodia's Hun Sen should easily find himself amongst the West's "Axis of Evil," the subject of crippling sanctions, and at the very least, uninvited to visit the US, or lent legitimacy by being allowed to host US representatives. In the first nine months of the year, we have seen the killing of Cambodia's leading environmental activist, a journalist and a 14-year-old girl whose community faced eviction. We've also seen the conviction of 13 land activists for legitimate protests; a judicial move against one of the country's most respected human rights activists; the harassment of politically active monks; and the arrest of an independent radio station owner on charges of secessionism. And these are just the most outlandish and publicised incidents. Cambodia is in the grip of a land-grabbing crisis that has seen more than 2m hectares (5m acres) of land transferred mostly from subsistence farmers to agribusiness. And as good land becomes scarce, the battle for it is becoming increasingly intense. An estimated 400,000 people have been affected by land disputes since 2003. 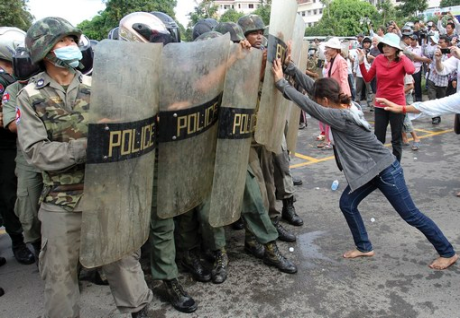 For the average Cambodian, the only avenues that offer the prospect of success are public protest and individual action. The government is well aware of the desperation, and this fact helps explain the recent spate of arrests, killings and harassment. The authorities are increasingly using violence to keep a lid on things. If evictees don't go peacefully, private firms are willing and able to tap the resources of the state to forcefully capture land. Yet despite Hun Sen's government brutalizing its own people with harassment, violence, and murder, displacing hundreds of thousands of civilians, and stealing the land right out from under the nation's poor, it was recently announced that US President Barack Obama would be visiting Cambodia to meet with Prime Minister Hun Sen. There has been no protest or formal condemnation by the US regarding Hun Sen and his systematic campaign of theft and violence waged against the Cambodian people, nor has there been any protests of political ramifications imposed by the emerging supranational block ASEAN who is in fact holding their annual meeting in Phnom Penh, Cambodia this month. Image: While the West funds and arms verified Al Qaeda militants invading Syria for alleged "humanitarian concerns," tacit approval is granted to governments like that of Hun Sen of Cambodia to brutalize his own population in sweeping land grabs that have left hundreds of thousands of Cambodian people without homes or a livelihood. The difference? Syria refuses to capitulate to Wall Street and London's "international order," Cambodia is eagerly selling off its sovereignty to it. The reason for silent complicity is because the land Hun Sen steals goes directly to foreign corporations, including those in both neighboring Southeast Asian nations, as well as the United States, United Kingdom, and Europe. Similar atrocities have been tacitly approved by the West in Uganda, where a similar mass murderer, dictator-for-life Yoweri Museveni has been given a blank check to seize land on behalf of foreign corporations using his US-armed and trained military to carry out land-grabbing operations. Clearly the West's commitment for "human rights," "democracy," and "freedom" is a selectively enforced set of values, just as driven by self-serving corporate-financier interests as tacit, or even active support for land grabbing, mass murder, and pillaging across the third-world. The taint such hypocrisy brings to the so-called "international community," leaves permanently disfigured any concept of "international rule-of-law," and resigns entirely the legitimacy of Western governments and silent global institutions from presuming authority to meddle elsewhere while profitable exceptions are quietly made in nations like Cambodia.